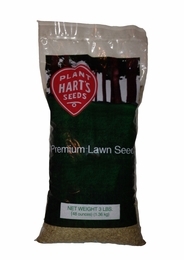 Coastal is Hart's best mixture for minimum maintenance or organic lawns. This mix requires much less water and fertilizer to look its best and is slow growing. Drought and salt tolerant. A great choice for roadsides, seasides, or entire lawns where little or no maintenance is desired. All varieties are improved fine-bladed, perennial turf grasses with quick establishing turf type ‘nurse’ ryegrass. Hard Fescue (30%), Chewings Fescue (30%), Creeping Red Fescue (30%), Transist Intermediate Ryegrass (10%). Best if little or no fertilizer is used after initial establishment and plan on over-seeding every two to three years to maintain its lush appearance.